Aha, now I have lots of Prussian Blue! Pp asked if there was anything I'd like him to bring back from his recent driving holiday in Scotland. I said, 'yes, a tube of Prussian Blue'. "Frodo and Sam halted and sat silent in the soft shadows, until they saw a shimmer as the travellers came towards them. There was Gildor and many fair Elven folk; and there to Sam’s wonder rode Elrond and Galadriel. Elrond wore a mantle of grey and had a star upon his forehead, and a silver harp was in his hand, and upon his finger was a ring of gold with a great blue stone, Vilya, mightiest of the Three. But Galadriel sat upon a white palfrey and was robed all in glimmering white, like clouds about the Moon; for she herself seemed to shine with a soft light. On her finger was Nenya, the ring wrought of mithril, that bore a single white stone flickering like a frosty star. Riding slowly behind on a small grey pony, and seeming to nod in his sleep, was Bilbo himself." Very nice! One of my favorite verbal descriptions in LotR. Also, love the blues. 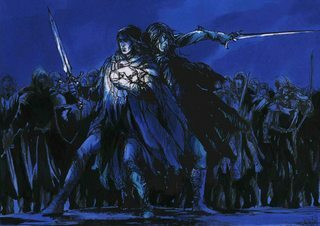 Is reminiscent to me of that all-blue picture by Kasiopea of Maedhros and Maglor stealing back the Silmarils. I don't think I've seen that one, but I like a good nocturne, I've decided. I particularly like the hound! 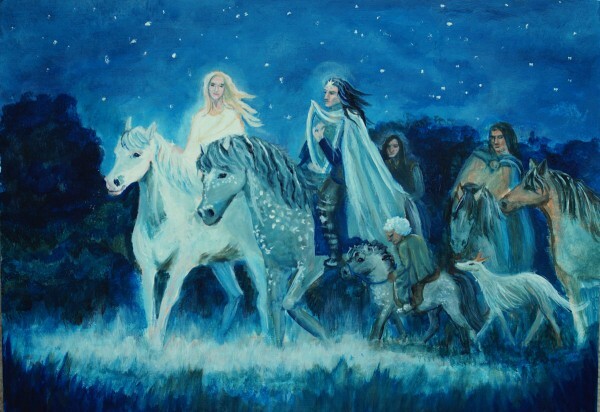 Lovely blues, and I like how you did the contrasting postures of Galadriel, Elrond and Bilbo. Have you decided whether the hound belongs to Elrond? I spotted a few things about this that I needed to fix, of course, as soon as I uploaded it, but I haven't photographed the new version yet. I don't know who the hound has attached itself to! It does seem to be looking at Elrond, though it would also go rather well with Galadriel's white dress. Lovely picture - you've made good use of the colours! A friend in Norway used to always get me to bring a particular kind of oatmeal! This is really lovely. The Prussian Blue was definitely the best sort of souvenir for you! When I was a child, spending Sundays at our grandmother's house, there was a painting show that we would watch hosted by an older German? man. He was very fond of Prussian Blue. I don't remember that he used any other sort of blue.